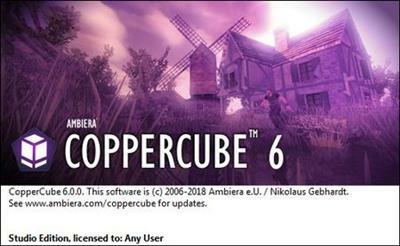 CopperCube is a complete 3D authoring tool which includes all the features you need for creating games for multiple platforms. And it is light-weight: The whole editor including everything just needs about 70 MB, and your finished created games is just one small .exe file. Or a just 200 KB sized .js file in case of WebGL. There is no easier software for creating 3D games. It is easy for beginners and fun for experienced users. You don't even have to write code in order to use it. Just click everything together. Of course, apps created with CopperCube can freely be sold. Want to create an application from your 3D scene? Click 'Publish' and wait about one second. Done! CopperCube is incredible easy and fast. CopperCube includes a terrain editor. Terrain can be drawn with height painting tools directly in the editor, textures can be painted quickly with automatic texture blending into the terrain. There are also tools for placing grass and bushes, and for distributing meshes automatically over the terrain. CopperCube supports realtime shadows AND static light/shadow calculations. They can even be mixed, if you like. Add a nice atmosphere to your game by just clicking a checkbox to enable realtime shadows, or calculate static lighting by clicking the "calculate!" button (see below). This works even very fast on the WebGL target. CopperCube supports automatic movement of vegetation, no matter if it was generated inside CopperCube or imported from external 3D models. There is no performance impact, everything is computed on the GPU. Wind parameters are easily adjustable.